Guadalupe St., near W. 28th St. Graphic: Google Street View. As Austin Rail Now has repeatedly pointed out, there are various ways that a starter light rail transit (LRT) line could be fitted workably into the Guadalupe-Lamar corridor. 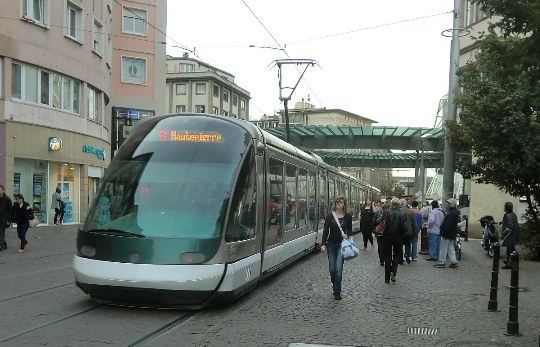 In our December 2014 article «San Francisco’s N-Judah Muni Metro line shows design option for light rail in Austin’s Guadalupe-Lamar corridor» we suggested a design alternative with the objective of inserting dedicated LRT lanes while minimizing disruption and cost and maintaining four traffic flow lanes. In this, we showed how a San Francisco LRT design could serve as a model for installing a dedicated LRT alignment in the relatively narrow 80-foot width of the Guadalupe-Lamar corridor (see illustrations below). San Francisco’s N-Judah LRT line could serve as design model for Austin’s Guadalupe-Lamar corridor. Photo (copyright) Eric Haas. This past December, another design proposal was made public by Austin community urban activist and Guadalupe-Lamar rail transit supporter Andrew Mayer. Compared to Austin Rail Now’s relatively minimalist approach, Andrew’s design is considerably more ambitious — with undoubtedly more urban impact and capital expense — but it embodies good ideas and hints at the kind of range of optional approaches available to ensure that LRT will work in this key central corridor. I feel like these designs are relatively ambitious (2 transit lanes, 4 auto lanes, 2 separated bike lanes, 2 12 ft sidewalks along most of its length), but revamp Guadalupe and Lamar into more complete streets, while seeing if I could retain the existing number of auto lanes. Some of these ideas I came up with way back in 2009 (i.e. the split direction of traffic along west campus, the wide boulevard between 38th and 51st st), some are more recent. Regardless how much you agree or disagree with these designs, I hope this contributes to the discussion of rail on Guadalupe/Lamar, as I feel like detailed discussion of street design is warranted if there is going to be a push to get [Guadalupe/Lamar/Congress] urban rail on the ballot as soon as possible. In this proposal, space for station platforms appears to be appropriated from pedestrian/bike space. 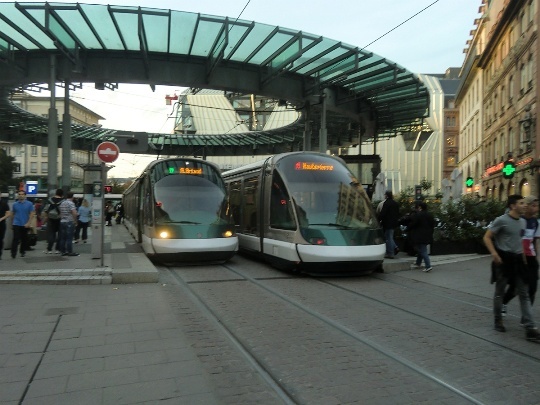 It’s not explicit in Andrew’s design, but station platforms would likely be staggered across intersections (a common space-conserving technique in LRT design). Andrew also suggests that “platform” space might be allocated to use as a turning lane for motor vehicles (although this could conflict with the need for a station platform at that same point). 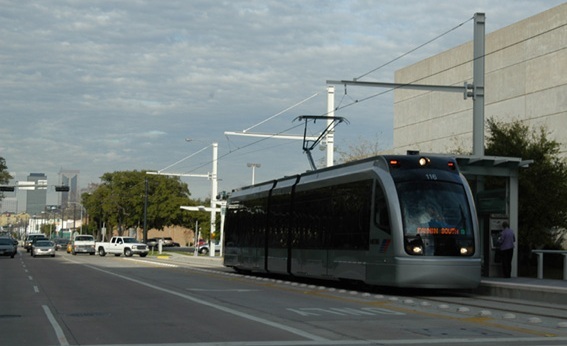 Another option, deployed in Houston Metro’s MetroRail LRT design, is to allow a turn lane to share the LRT track (with traffic signal control coordinated with train movements — discussed briefly in our article «Houston’s MetroRail shows the way — How to fit urban rail into Austin’s Guadalupe and Lamar»). Between 24th and 29th St. (Andrew calls this the North Drag), Guadalupe narrows somewhat, constricting the space for LRT as well as pedestrian and bike facilities (see streetview at top of post, and aerial view, below). Andrew’s solution is to rely on the fact that southbound traffic has been re-routed to other streets; he also narrows the sidewalks and assumes that the bicycle route can be re-routed through this section to an available parallel street (Hemphill Park). At West 38th St. (shown in a Google Street View below), Andrew apparently proposes a short subway section, commenting “The transit lanes plunge beneath the street in a shallow cut-and-cover tunnel (basically an underpass) so there can be turning lanes for NB auto traffic without expanding the road’s ROW [right-of-way]….” Technically, this is possible — but quite an expensive feature, particularly since a station for this important east-west arterial would certainly be justified (and a subway station would add a considerable capital expense). Our own design (which avoids any heavy civil works) assumes that LRT, like MetroRapid buses and ordinary traffic, would simply continue to operate through the W. 38th St. intersection at-grade, following the current surface street profile. Nevertheless, Andrew’s tunnel proposal indicates that there are indeed other options in the planning toolbox that could be considered to address engineering, political, or other concerns. Use of this property in this manner as part of an LRT alignment has been proposed in various studies and propositions over the past 25 years. The day is surely coming when the State will seek to divest itself of this property, perhaps to private interests, so if an easement for ROW expansion is to be procured, official planning and action would seem urgent. Yet no public body, particularly neither Capital Metro nor the City of Austin, has taken a single official step toward this goal in all the years the idea has been on the table. Having transitioned to North Lamar, the alignment with Andrew’s proposed design would seem to require acquisition of more ROW to accommodate a cross-section width of 115 feet for pedestrian and bike facilities, landscaping, and buffer zones (see typical cross-section, below). The expanded roadway would work by turning the parking spaces in front of businesses into larger sidewalks and bike lanes. Parking lanes would be put in between the auto lanes and bike lanes where possible to allow for some parking capacity. I HIGHLY recommend doing a study of the traffic going to businesses along this section of N Lamar. 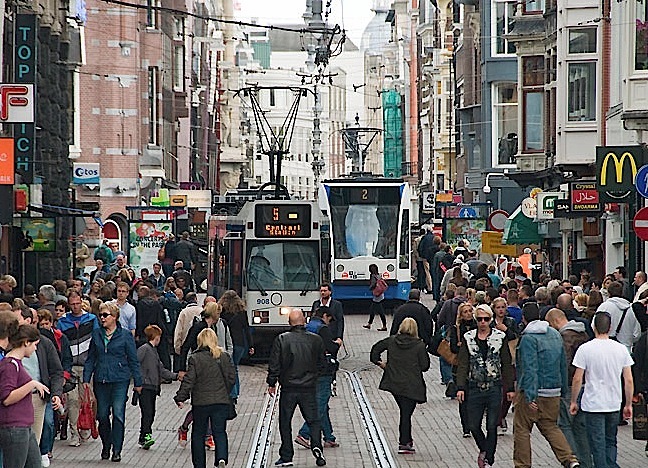 How many customers can access the business by foot/bike/transit? For those who have to drive, is there enough parking on the street or behind the business? Andrew’s wide streetscape design (which undoubtedly would require extensive and costly adjacent property acquisition) contrasts with our own narrower design proposal which assumed insertion of LRT within existing public ROW (except at intersections with stations, where modest widening would occur). There’s no question that widening North Lamar with amenities such as Andrew has suggested would create a significantly enhanced environment for the public. The issue here is whether it should be included in the initial starter line design, or proposed as a later major upgrade to the corridor. Andrew also proposes an “Alternative 2” in which “Transit lanes and the station go into a cut-and-cover tunnel beneath the auto lanes.” He acknowledges that such a subway would be “More expensive and complex to construct, but retains the same number of NB auto lanes and allows for wider sidewalks and more parking.” Andrew indicates a preference for his first alternative, keeping LRT on the surface. Austin Rail Now believes that an initial surface starter LRT line could safely and efficiently operate through the Crestview intersection as it basically exists. Ultimately, however, some method of grade separation at this complicated intersection may be prudent. We believe this should involve either tunneling or elevating (or both) the motor vehicle traffic — leaving the surface to transit, pedestrians, and bicycles. Not only is this approach more compatible with a livable, walkable environment, but it also recognizes that there is many times greater funding available, from all sources, for roadways, while transit is strapped for resources. Considering both our own design proposal and Andrew Mayer’s more ambitious approach, our thoughts return to the controversy over Project Connect’s ill-fated urban rail planning process and proposal that emerged through the fall of 2013 and eventually crashed and burned in the November 2014 vote — in particular, the expressions of skepticism, utter hopelessness, deficit of vision, and outright hostile resistance voiced by several members of the Central Corridor Advisory Group (CCAG) and Austin City Council in their efforts to disparage and dismiss the possibility of installing LRT in the Guadalupe-Lamar corridor. Fortunately, that nonsense (whether based on misunderstanding, ignorance, or cynical political sniping) has mostly evaporated. Between the two designs now already on the table, it’s possible to see that in reality a broad range of alternatives and design options is available to make this happen. It’s neither impossible nor astronomically expensive. We believe our “minimalist” design is the most immediately affordable, workable, and attractive to voters and the public at large — but that’s just our assessment; we strongly believe all options are worth considering. 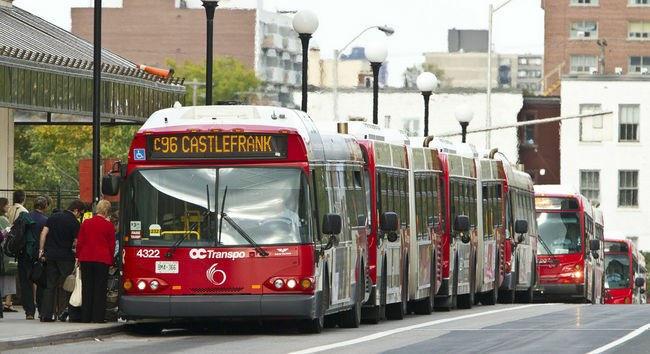 Ottawa’s “BRT” Transitway delivers a “conga line” of buses onto urban streets. Photo: Errol McGhion. Which kind of transit — urban rail or buses in special lanes — do you want to see on Guadalupe-Lamar? It’s crucial that Austin’s first urban rail (starter) line be a whopping success. This means it must serve the heart of the city in its heaviest-traffic corridor, with its highest densities and employee and employment concentrations, and its most long-established neighborhoods. 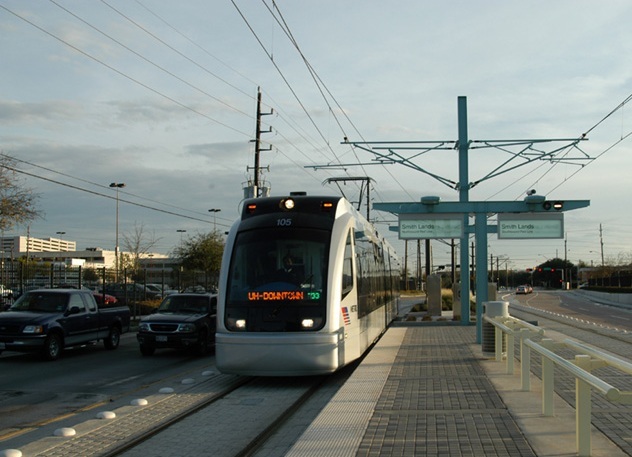 The Guadalupe-Lamar corridor offers the ideal alignment for an affordable, cost-effective surface light rail alignment. It’s also important to understand that if we don’t get light rail transit (LRT) on Guadalupe and North Lamar, we most certainly will get dedicated bus lanes within the next 10 years. A major project to overhaul the corridor by installing infrastructure for battalions of MetroRapid buses is waiting in the wings if urban rail is not implemented. 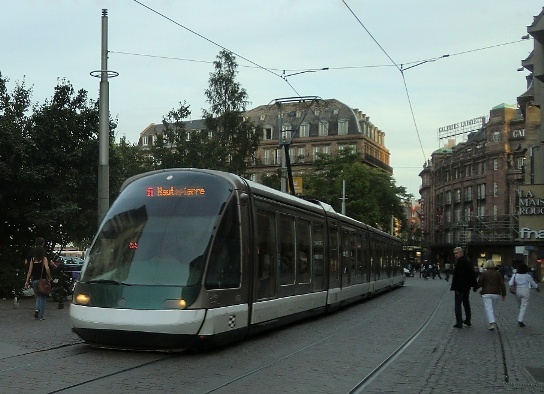 This alternative, not requiring a public vote, would produce a far less efficient, adequate, and attractive system, seriously degrade urban conditions, and result in a less livable environment compared with urban rail. This package of so-called “Bus Rapid Transit” (“BRT”) projects — whereby MetroRapid buses would enter stretches of dedicated bus lanes, and then merge back and forth, into and out of mixed general traffic — was first raised publicly in a Project Connect/City of Austin Transportation Department presentation made in City Council chambers on 25 May 2012 to the CAMPO Transit Working Group (TWG). Shown below is page 10 of that presentation, with arrows pointing to the relevant information. 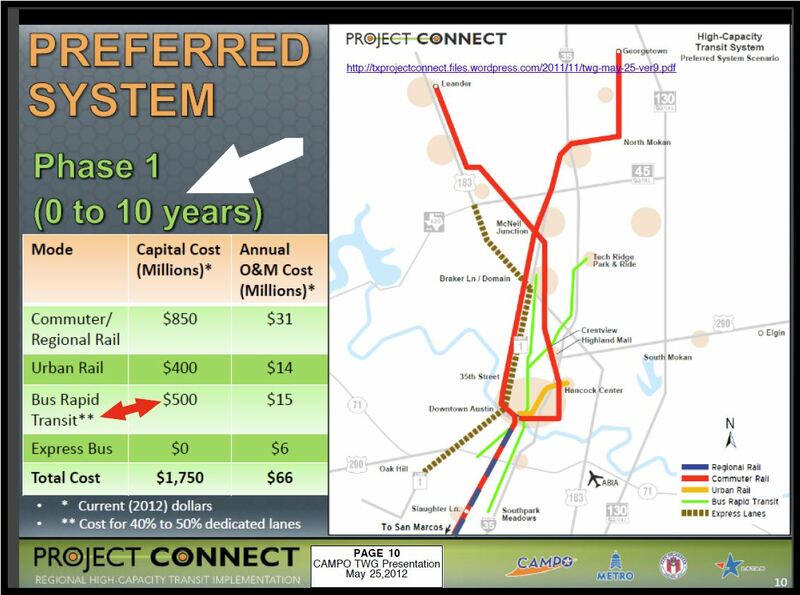 Excerpt from Project Connect presentation in May 2012 indicating planned $500 million package for MetroRapid “BRT” facilities, including Guadalupe-Lamar. Graphic: Project Connect. These dedicated lanes will be built with 80% federal money, will not require an election, will be vetted publicly only at art gallery-style “open houses”, and approved by boards and commissions, the Capital Metro Board, and the Austin City Council, and then they will be built, unless we implement urban rail in the Guadalupe-North Lamar corridor. And keep in mind that — unlike the current minimalist MetroRapid project — this level of hefty physical investment in roadway infrastructure will become a de facto obstacle to any future rail project in the corridor. These dedicated bus lanes are the official plan as things currently stand. 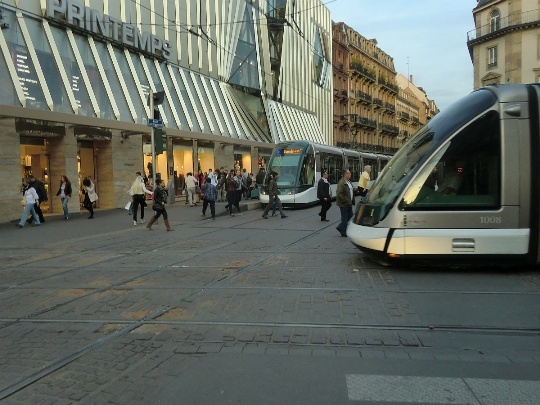 • LRT on average is significantly more cost-effective than bus operations. • Buses don’t attract nearly as much ridership as LRT, but as ridership starts to reach higher volumes, bus traffic and overwhelming “conga lines” of buses cause more problems … plus more queues of riders start to slow operations. 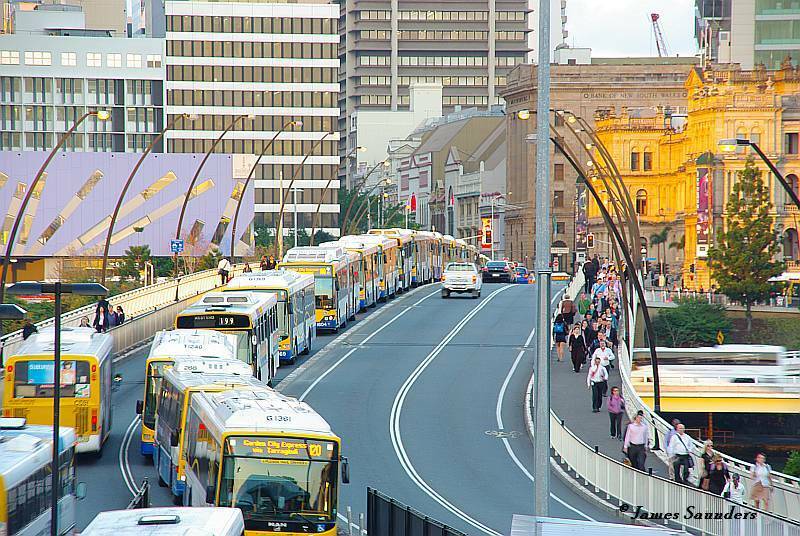 Brisbane, Australia: More “conga lines” of buses travel on reserved lanes between the city’s downtown and a busway. Photo: James Saunders. If you would prefer urban rail instead of a major bus lane project in Guadalupe-Lamar, it’s essential to speak up and act. Let neighborhood groups and other community organizations know what official plans have in store for this corridor. Sign petitions being circulated to support urban rail on G-L. Communicate to Project Connect and members of Austin City Council that you want to ride urban rail on Guadalupe-Lamar, running in reserved tracks, not just a souped-up bus service weaving in and out of special lanes. Houston’s MetroRail demonstrates that LRT can attract and carry more passengers faster, more effectively and safely, and more cost-effectively than high-capacity bus operations. Photo: Peter Ehrlich. Except for the the somewhat clunkier styling of the railcars, this 2000 simulation of what light rail transit might look like on the Drag is not that different from one of the options today. Graphic: Light Rail Now collection. Some supporters of the Guadalupe-Lamar (G-L) corridor for Austin’s urban rail starter line have been seeking details about how urban rail (i.e., light rail transit, or LRT) would be installed in these thoroughfares — running in mixed traffic, in reserved lanes, or how? At about the same time, proponents of the Official (aka City of Austin-Capital Metro) proposal for an urban rail line from downtown to Mueller have recently begun raising the issue of right-of-way (ROW) constraints in this same G-L corridor. It’s important to keep in mind that the Mueller proposal itself has its own ROW constraints and other challenges, but I think it would be helpful here to address some of the issues in the G-L corridor. One of the reasons for this is that I’m not convinced that all parties in the Project Connect team will necessarily make a good-faith effort to find a truly workable, affordable design for inserting urban rail into the G-L thoroughfare alignments — and advocates need to be prepared to insist that valid (and proven) alternatives be examined. 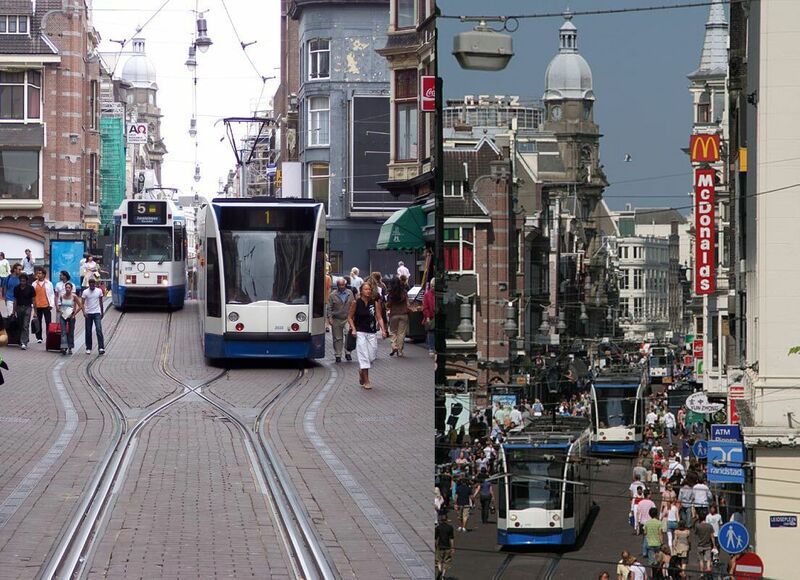 The basic idea is for urban rail (light rail transit, LRT) to operate totally, or almost entirely, in its own lanes. This would require some reconstruction of Lamar Blvd. and probably Guadalupe St. in sections, including slight narrowing of existing lanes, elimination of the turning (“chicken”) lane and replacement with transit-integrated traffic controls (such as left turn lanes), and other measures. 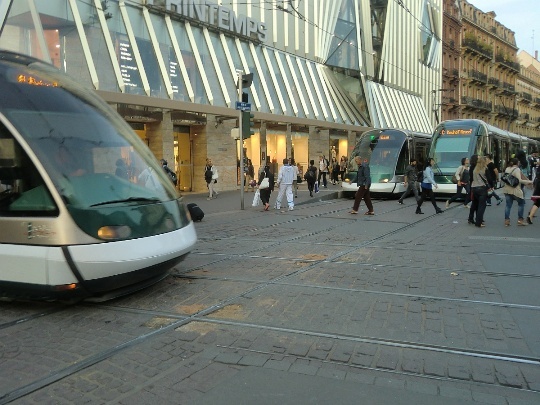 Light rail systems in places like Portland, Dallas, Houston, Phoenix, Denver, Salt Lake City, etc. are models for this. Having crossed intersection, Houston LRT train accesses station on Fannin St. as traffic control system allows queue of motor vehicles to make left turn over track reservation behind it. Photo: Peter Ehrlich. Also keep in mind that Project Connect’s longer-range plan for buses on Lamar-Guadalupe is to install tens of millions of dollars’ worth of reserved lanes — so official planners are already prepared to bite a bullet on this basic issue. 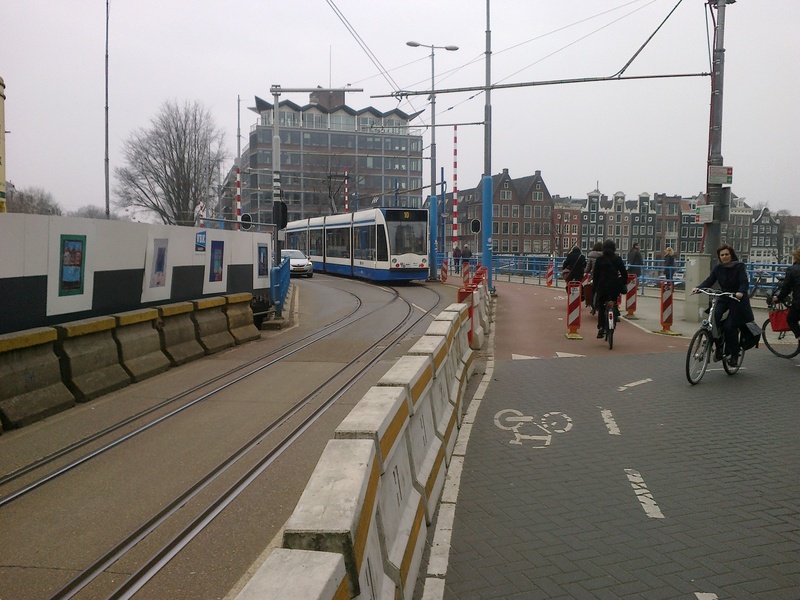 What advocates of urban rail in the G-L corridor are saying is that it makes a lot more sense to install reserved lanes for rail rather than buses. It’s possible that there might be a short section of LRT in mixed traffic (one or both tracks). 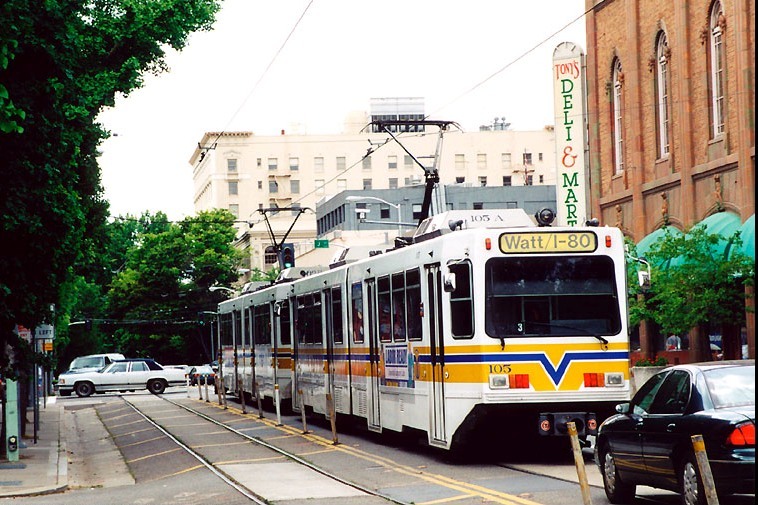 Sacramento’s LRT operates with this kind of compromise (for about a mile along 12th St., approaching the city’s downtown from the northwest), and has done so for the past 26 years — see Advantages of Light Rail in Street Alignments. Sacramento’s LRT shares one lane with traffic along 12th St.
Further downtown, south of MLK Blvd., it would be logical for the double-track line on Guadalupe to split into two single-track lines — southbound on Guadalupe, northbound on Lavaca St. 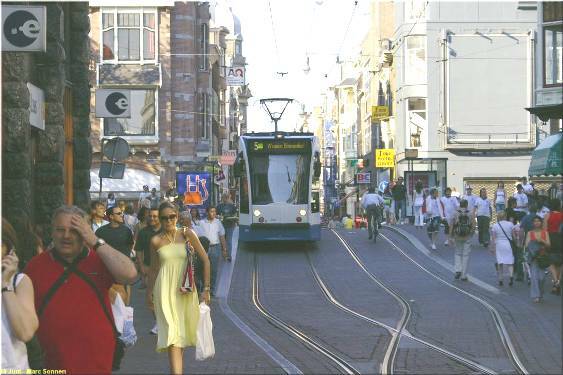 However, it’s likely that LRT would need its own priority lanes in these streets. Here’s why: The “Transit Priority Lanes” now being installed on the Lavaca and Guadalupe street pair already seem to present major problems for MetroRapid bus, much less LRT. The reason: Official plans involve inserting MetroRapid into a single lane each way along with well over two dozen bus routes. The City’s own 2011 study of this warned that delays to transit might result. And that’s even before urban rail comes along. It seems eminently reasonable that LRT would need its own reserved lanes on the opposite side of each street (Lavaca and Guadalupe) from the bus lanes. 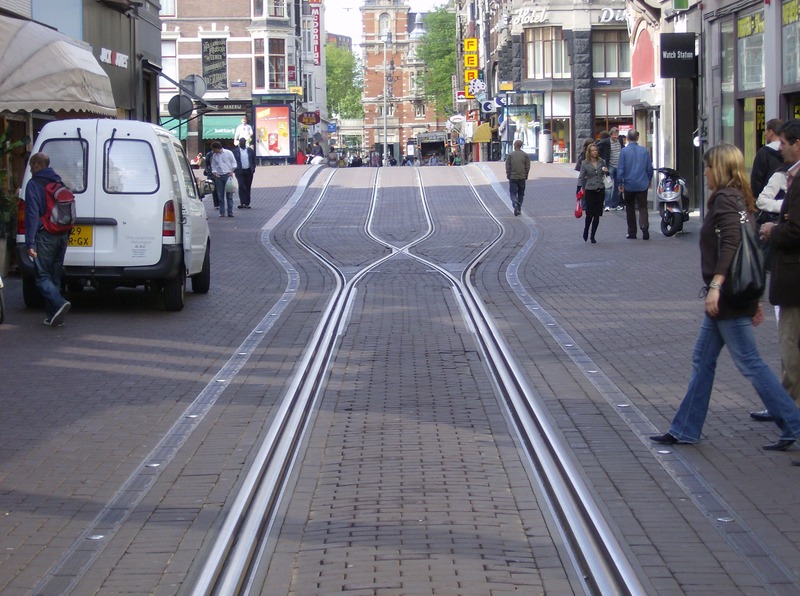 It’s possible that urban rail could perhaps share lane use with MetroRapid, but not with all those other routes. Since MetroRapid buses can operate only on the righthand side of the street, these buses (with righthand-side doors) couldn’t share a “lefthand” lane with urban rail on the opposite side of each street. 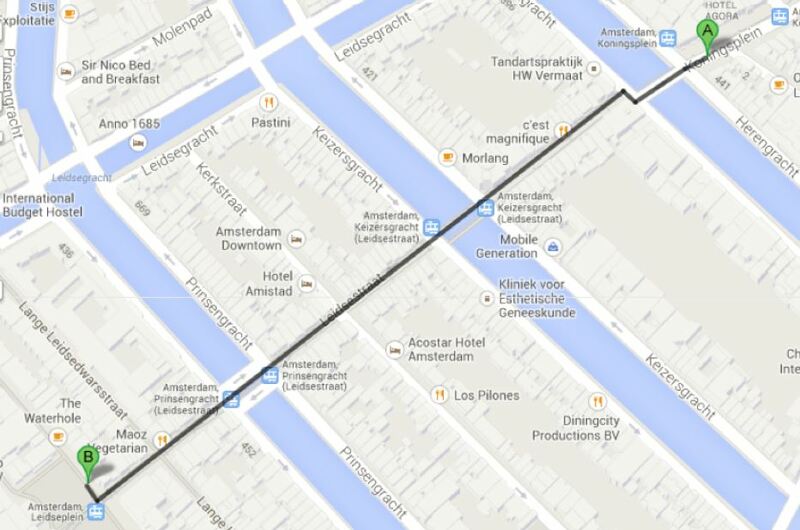 So the solution seems to come down to reserving an additional lane exclusively for urban rail on each street.